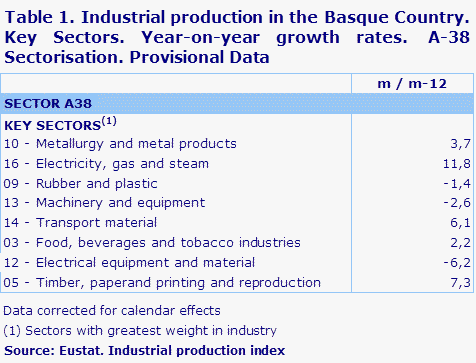 Industrial production of the Basque Country in December 2015 was up by 3.1% compared to the same month of 2014, in homogenous terms of the working calendar, according to Eustat data. 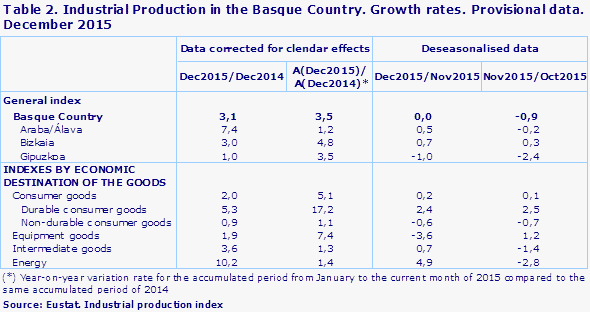 Compared to the previous month, November 2015, the industrial production of the Basque Country remained constant (0.0%), once seasonal effects had been corrected. The evolution of the index in December 2015 compared to December 2014 was positive for all the main industrial sectors. Energy went up by 10.2%, Intermediate Goods by 3.6% and Capital Goods by 1.9%. Consumer Goods rose by 2.0% overall as a consequence of the increase that occurred, above all, in Consumer Durables, which were up by 5.3%, whilst Consumer Non-Durables, which also rose, did so more moderately (0.9%). The month-on-month variation for December 2015 on November 2015 was negative for Capital Goods, which registered a downturn of 3.6%. Energy, on the other hand, posted a rise of 4.9%, Intermediate Goods were up by 0.7% and Consumer Goods as a whole were up by 0.2% due to the increase experienced by Consumer Durables, which rose by 2.4%, with Consumer Non-Durables falling by 0.6%. Among the largest sectors in Basque industry, those that saw the most significant growth in the month of December 2015 with regards to year-on-year variations were: Electricity, Gas & Steam, which registered an upturn of 11.8%, Timber, Paper & Graphic Arts, which rose by 7.3%, and Transport Material, which registered a year-on-year increase of 6.1%. On the other hand, sectors that stood out were Electrical Material & Equipment with a negative rate of 6.2% and Machinery & Equipment, which experienced a year-on-year fall of 2.6%. By province, the year-on-year performance of the Industrial Production Index for December was positive in the three provinces: in Álava it was up by 7.4%, in Bizkaia it rose by 3% and in Gipuzkoa there was an increase of 1%. The month-on-month performance was positive in Bizkaia, where it increased by 0.7%, and in Álava, where it was up by 0.5%, while it fell in Gipuzkoa by 1% compared to November 2015. The 2015 balance for the Basque Country with respect to the previous year ended with a rise in the Industrial Production Index of 3.5%, more than doubling the rate for 2014, which was 1.4%, following two years of downturns: -5.9% for 2012 and -3.2% for 2013. According to the economic destination of the goods, all the sub-sectors registered positive rates in the 2015 balance. The greatest increases were experienced by Capital Goods, which went up by 7.4%, and Capital Goods, which were up 5.1% overall. Amongst these sectors, the increase posted by Consumer Durables was 17.2%, with Consumer Non-Durables posting a 1.1% increase. There were also more moderate positive annual rates in Energy, with 1.4%, and Intermediate Goods, with 1.3%. The accumulated variations in 2015 for the three provinces were also positive: in Bizkaia the index rose by 4.8%, in Gipuzkoa it was up by 3.5% and Álava saw an increase of 1.2%.